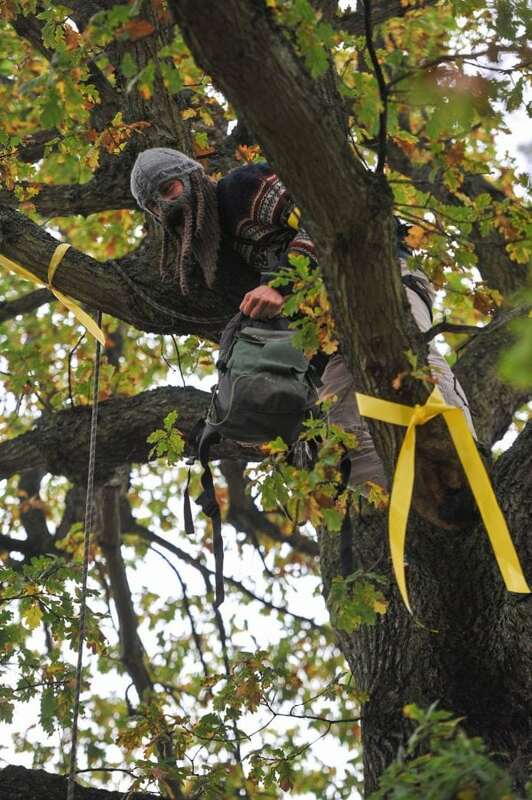 An activist scaled a 150-year-old oak tree today (mon) in a bid to prevent it from being felled by a local council. Residents gathered in the street where the tree is sited today (October 16) in the hope of stopping the council from tearing it down. TV presenter Vernon Kaye is among campaigners who have appealed to Sheffield City Council to re-think pavement resurfacing plans and save the much-loved oak. In a video appeal, he said: “Sheffield Council, come on. Protestors, including Sue Unwin, 59 (right), oppose the felling of a 150+ year old oak tree on Vernon Road in Sheffield, South Yorks., October 16 2017. 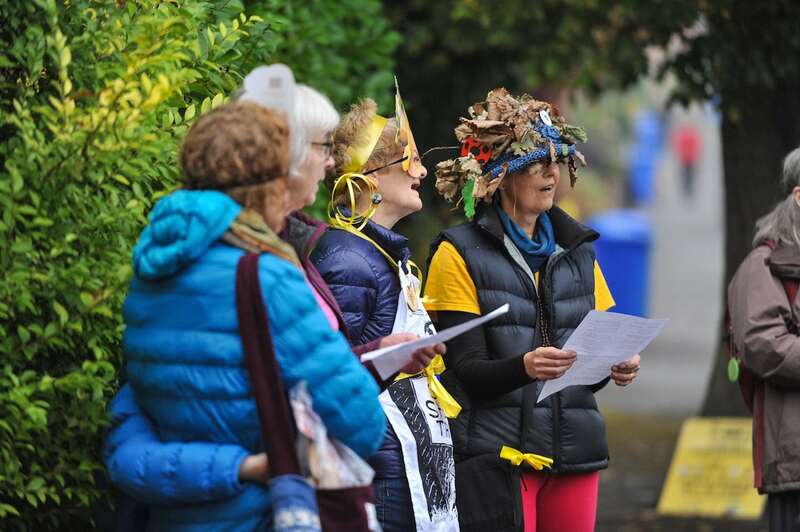 Campaigners have converged on Sheffield’s Vernon Road, South Yorks., bedecked in yellow ribbons and singing songs ahead of announcement that felling was due to start this week. One campaigner has even scaled its branches with a climbing rope, telling onlookers “I’ll stay here all week if I have to” as they passed him food and supplies from ground level. Resident Sue Unwin has created a focal point for campaigning in her back garden and has messages on display from various protesters including MP Nick Clegg. Appearing on the street today, Sue from Sheffield Save Dore, Totley and Broadway Trees, said: “I sincerely hope this tree can be saved. “I’ve lived here for 20 years and it’s the first thing I see in the morning. “There’s a guy up the road who is 93 – he and his mates used to meet at the tree when they were kids. “The first part of the street was built in the 1930s and then they extended it in the 1960s with some quite dull houses. The protest comes in the midst of a bitter row between activists and Sheffield City Council over a 25-year highways maintenance project with a private contractor which will see thousands of trees felled. Since the Sheffield’s “Streets Ahead” project began in 2012 5,600 trees have been felled with 400 set for removal by the end of the year. The oak tree on Vernon Road in the well-healed Sheffield suburb of Dore preserves a time when the now built-up suburb was nothing more a few Derbyshire fields. It has become one of the most important trees in Sheffield’s campaign against the city council’s campaign against felling. Protester Margaret Peart, also of Save Dore, Totley and Bradway Trees, who is out on the street, said: “Vernon Oak has been growing where it is for at least 150 years and it is a perfectly healthy tree which preserves a time when Dore was agricultural. “There was a time when this tree was growing in a field in Derbyshire – before Dore became part of the city of Sheffield. “There are pictures which show the fields here before Vernon Road was built and the tree is in them. “If we lose this tree it will be more than sad – it will be the disastrous and totally unnecessary depletion of green areas. The latest Sheffield activist facing legal action is Sheffield Green Party councillor Alison Teal. Calvin Payne, 45, a Sheffield historian and tour guide, is charged with breaking the injunction and inciting others to do so. He said: “People who have never broken the law in their lives are considering breaking this injunction now. “I will be pleading not guilty on the basis that I do not think breaking this injunction is a crime. 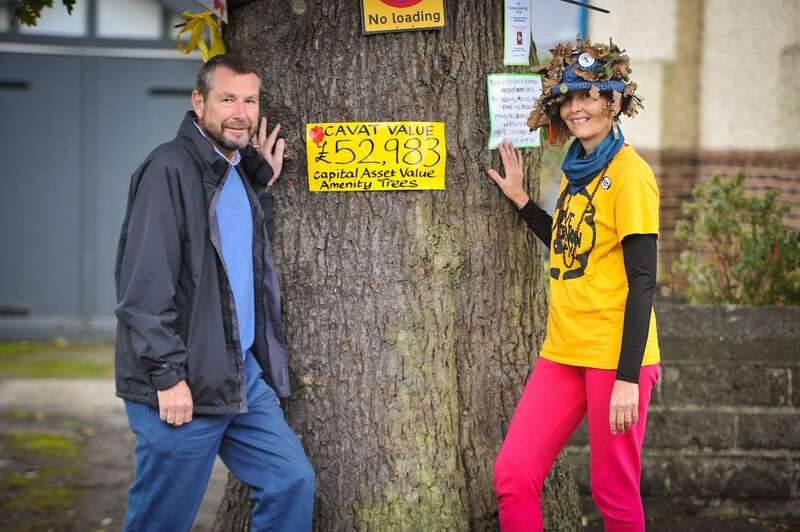 Protestors, including Colin Ross, 64, and Sue Unwin, 59, oppose the felling of a 150+ year old oak tree on Vernon Road in Sheffield, South Yorks., October 16 2017. “Unfortunately, a very small number of tree activists are continuing to trespass inside the exclusion zone erected around tree works despite a High Court ruling stating that anyone who did so is acting unlawfully and would be in contempt of court. “The continued breach of the injunction is both disappointing and unacceptable and will now result in further court action and potential imprisonment for those involved. “What’s more, this direct action is in complete disregard of the law and goes against the wishes of the majority of people in Sheffield who are in support of our work. “UNDER THE CONTRACT THEY HAVE TO FULFIL ANY PROMISE” . Where alternative design solutions are not available… the potential impact of the proposals on the tree should be assessed, and a Tree Protection Plan and Arboricultural Method Statement produced. When I met Cllr Lodge (SCC’s Cabinet member for Environment & Streetscene), on 1st August 2016, he said that SCC HAD FINED AMEY OVER £2 MILLION DURING 2015, for neglect to meet agreed standards. He added that SCC were “just in the process of taking some action against Amey”, for the same reason. I was led to understand that the fine money was available and could be used specifically to retain trees . In short, provided Amey honour their existing contractual commitments, and the Council’s Highways PFI Client Team provide adequate ON-SITE SUPERVISION, MONITORING, AND ENFORCEMENT of compliance with the range of current good practice guidance and recommendations that the Streets Ahead team claim to comply with [4 & 9], there is no reason why the majority of mature street trees currently scheduled for felling can’t be safely retained, long term. In law, and in practice, Sheffield City Council has sufficient discretion to insist on A SUSTAINABLE APPROACH to stewardship of the highway tree population and prevent further UNNECESSARY, AVOIDABLE LOSS AND IRREVERSIBLE ENVIRONMENTAL DEGRADATION. Time for SCC & Amey to start honouring existing policy commitments . See D.Long’s previous letter: “The Battle For Sustainable Stewardship of Sheffield’s Street Trees” ( https://www.stocksbridgecommunity.org/comment/810#comment-810 ) and the audio recording that accompanied it: “HTAF 2_2nd_September_2015_Steve_Robinson – SCC Head of Highway Maintenance_NO EXTRA COST SOLUTIONS_150902_001_2_3_2”. The audio is transcribed on page 47 of the SORT letter [3, above]. Listen to the attached audio clip, from the second meeting of the “bi-monthly” Streets Ahead Highway Tree Advisory Forum, held on 2nd September 2015, attached above (HTAF 2_2nd_September_2015_Steve_Robinson – SCC Head of Highway Maintenance_Section 58 Defence – Insufficient Funding_150902_001_2_3_2). The audio is transcribed on page 45 of the SORT letter [3, above]. “Anyone who cares about the trees on Sheffield’s streets can come along to the Highway Tree Advisory Forum meeting. Reference: The British Standards Institution, 2012. British Standard 5837:2012 Trees in Relation to Design, Demolition and Construction – Recommendations”. London: BSI Standards Ltd. The quotes used are from pages one and twenty-three of the standard. The Streets Ahead team Claim to comply with a range of “national best practice”. See Amey’s previously commercially sensitive contract document [4, above]. “all works will be supervised by a qualified arboriculturalist [sic] TO ENSURE NO TREE ROOT DAMAGE OCCURS as part of our works. The Streets Ahead team work to National Joint Utilities Group (NJUG) regulations AND RELEVANT BRITISH STANDARDS for construction works in the vicinity of trees”. “’WELL-MANAGED HIGHWAY INFRASTRUCTURE’ SUPERSEDES THE PREVIOUS CODES’ Well-maintained Highways’, ‘Well-lit Highways’ and ‘Management of Highway Structures’. This was published on 28 October 2016. (A letter from Save Our Roadside Trees [SORT], dated 11th July, 2016, addressed to Simon Green (10a) and David Caulfield (10b), sent on 11th July, 2016. Then SCC Executive Director for the “Place” portfolio, which included responsibility for the £2.2bn, city-wide, Streets Ahead highway maintenance project [Mr Green has since resigned. Laraine Manley (10c) has been appointed as his replacement].